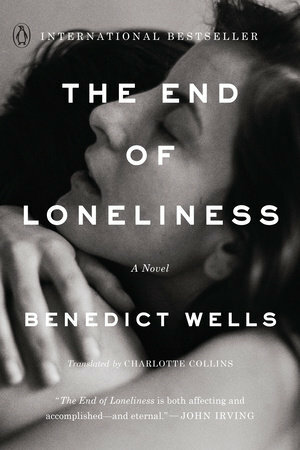 The following is from Benedict Wells' novel The End of Loneliness, translated by Charlotte Collins. The novel follows three estranged siblings who lost their parents as children, finding their way through life and hoping not to do it alone. Benedict Wells is a German writer living in Berlin. In 2016 he won the European Prize for Literature for his bestselling End of Loneliness. When I was seven, my family went on holiday to the south of France. My father, Stéphane Moreau, was from Berdillac, a village near Montpellier. One thousand eight hundred inhabitants, a baker’s, a brasserie, two wineries, a carpentry workshop and a football team. We were visiting our grandmother, who in the past few years had not left the village. As on all long drives, our father was wearing an old, pale brown leather jacket, pipe stuck in the corner of his mouth. Our mother, who’d been dozing for most of the journey, put on a cassette of Beatles songs. She turned to me. “Paperback Writer”—my favorite song, back then. I sat behind her, humming along. The music was drowned out by my siblings: my sister had twisted my brother’s ear. Martin, whom we all called Marty, screamed and complained to our parents. “Stupid snitch.” Liz pinched his ear again. They fought harder until Mother turned and gave them both a look. That look was a masterpiece. It conveyed understanding for Marty, with his mean sister, as well as for Liz with her annoying brother, but above all it conveyed that fighting was utterly pointless; furthermore, it even contrived to indicate that there might be ice cream for good children at the next petrol station. My brother and sister instantly stopped scrapping. “Because it’s the done thing. And because your mamie loves it when you visit,” said Father, in French, not taking his eyes off the road. “No, she smells like a moldy cellar,” said my brother. “Don’t keep saying things like that about your mamie!” Our father steered the car round a roundabout. I gazed out of the window. Thyme shrubs, garrigue and kermes oak stretched off into the distance. In the south of France the air was more fragrant, the colors more intense than at home. I put my hand in my pocket and played with the silver franc coins left over from last year. We reached Berdillac toward evening. In retrospect, the place always reminded me of a grouchy but essentially lovable old man who dozed all day. As in many parts of Languedoc, the houses were made of sandstone; they had plain shutters and reddish, weathered roof tiles bathed in the soft light of the setting sun. The gravel crunched beneath the wheels as our minibus came to a halt in front of the house at the end of the Rue Le Goff. There was something eerie about the building; its facade was overgrown with ivy, its roof dilapidated. It smelled of the past. Our father got out first and bounced up to the door. Back then he must have been in what you would call his prime. In his mid-thirties, he still had thick, black hair and was friendly and polite to everyone he met. I would often see neighbors and colleagues standing round him when he spoke and listening, spellbound. The secret was his voice: soft, not too deep, not too high, with the merest hint of an accent, it encircled his listeners like an invisible lasso and drew them in. He was very highly thought of in his job as a chartered accountant, but the only thing that mattered to him was his family. Every Sunday he would cook for us all; he always had time for us children, and his boyish smile gave him an air of optimism. Later, though, looking at photos of him, I realized that something wasn’t right even then. His eyes. There was a spark of pain in them, perhaps fear, too. Our grandmother appeared at the door. She had a wry set to her mouth and barely looked at her son, as if she were ashamed of something. They hugged each other. But there was also… the smell of coffee in the morning. Sunbeams on the tiled floor of the parlor. Subdued clattering from the kitchen as my siblings fetched the cutlery for breakfast. My father immersed in the newspaper, my mother making plans for the day. Afterward: cave tours, bike rides, or a game of pétanque in the park. Finally, at the end of August: Berdillac’s annual wine festival. A band played in the evenings, houses were decked with lanterns and garlands, and the streets were filled with the smell of grilled meat. My brother and sister and I sat on the big flight of steps in front of the town hall, watching the grown-ups dance in the village square. I was holding the camera my father had entrusted to me. A heavy, expensive Mamiya: I’d been tasked with taking pictures of the fête. I regarded this as an honor; our father never usually let us handle any of his cameras. Proudly, I took a few photos as he spun our mother elegantly across the dance floor. “Papa’s a good dancer,” said Liz, knowledgeably. My sister was eleven, a tall girl with blonde, curly hair. Already she was infected with what my brother and I called “theater sickness.” Liz behaved at all times as though she were on stage. She beamed as if several spotlights were shining on her, and spoke so loudly and clearly that even the people at the back had no difficulty hearing her. She liked to act precociously around strangers when in fact she had only just emerged from her princess phase. My sister drew and sang, liked to play outdoors with the neighbors’ children, would often go days without taking a shower, wanted to be an inventor one day then dreamed of being an elf the next, and there always seemed to be a thousand things going on in her head at once. Back then, most of the girls made fun of Liz. I often saw my mother sitting with her in her room, consoling her when her fellow pupils had been teasing her again or had hidden her satchel. Afterward, I’d be allowed into Liz’s room, too. She’d fling her arms around me, I’d feel her hot breath on my skin, and she would tell me everything she’d told our mother—probably more. I loved my sister to bits, and that didn’t change when, years later, she deserted me. After midnight it was still sultry and humid in the village. The men and women still on the dance floor—swapped parents among them—swapped partners after every song. I took another photo, although by this point I could barely hold the Mamiya. “Give me the camera,” said my brother. Marty snatched the camera from me. “You’re such a know-all. No wonder you haven’t got any friends.” Marty took a few photos. He was the middle child. Ten years old, glasses, dark hair, pale, nondescript face. You could clearly see our parents in Liz and me, whereas in appearance he had nothing in common with them. Marty seemed to have materialized from some kind of non-place, an alien who had positioned himself between us. I didn’t like him at all. In the films I saw, older brothers were always heroic boys who stood up for their younger siblings. My brother was a loner who spent the whole day sitting in his room playing with his ant colony or examining blood samples from dissected salamanders and mice; his supply of small dead creatures seemed inexhaustible. Not long ago Liz had called him a “disgusting freak,” which pretty much hit the nail on the head. I have only a few, fragmented memories of that holiday in France, apart from the dramatic incident at the end. But I do remember the three of us at the fête, watching the French children playing football in the village square and being overcome by a sense of foreignness. We’d all been born in Munich, and we thought of ourselves as German. Apart from some special meals, hardly anything at home indicated our French roots, and we rarely spoke the language. Yet our parents had met in Montpellier. My father had moved there when he finished school because he wanted to escape his family. My mother had moved there because she loved France. (And because she wanted to escape her family.) When our parents talked about those days, they spoke of evenings when they’d gone to the cinema or Mother had played the guitar, of their first meeting at a mutual friend’s student party, or of how the two of them—our mother by then already pregnant—had moved to Munich together. After hearing stories like these, my brother and sister and I always felt that we knew our parents. Later, when they were gone, we were forced to realize that we knew nothing about them, absolutely nothing. We went for a walk, but when we set off our father didn’t tell us where we were going, and he hardly said a word while we were walking, either. The five of us hiked up a hill and came to a little wood. My father stopped on the slope in front of a massive oak tree. “Do you see what’s carved there?” he asked. He seemed distracted. We stared at the oak. “Look, someone’s lopped off a branch.” Marty pointed at the rough circle protruding from the tree. “So they have,” murmured Father. My brother and sister and I had never met our Uncle Eric. We’d been told he’d died many years ago. “Why’s the tree called that?” asked Liz. He gazed up at the cool blue morning sky. Our mother leaned against him. I looked at the tree and repeated silently: L’arbre d’Eric. And then the holidays were nearly over: just one last trip. It had rained again in the night; fat dewdrops clung to the leaves, the fresh morning air wrapped itself round my skin. Whenever I got up early I had the wonderful sense that the day belonged to me. I’d met a girl from the village, Ludivine, a few days earlier, and was telling my mother about her. As always when we came to the end of our French holiday, my father was relieved to have got it out of the way for another year. Occasionally he stopped to take a photo, whistling as he did so. Liz wandered on ahead while Marty trotted behind us, bringing up the rear. We almost always had to wait for him. In the wood we came to a river full of fallen rocks with a tree-trunk lying across it. We had to get to the other side anyway, so my brother and sister and I asked if we were allowed to balance our way across. We too jumped up onto the trunk. Only then did we realize how high the drop was, how slippery the bark, how rocky and wide the river. It was almost ten meters across, and anyone who slipped and fell was sure to injure themselves. “There’s a bridge up ahead, anyway,” said Liz. Although she would usually try anything, this time she chickened out and walked on. My brother followed her. I was the only one who didn’t move. In those days I didn’t know the meaning of fear. Just a few months earlier I’d been the only one in my class who’d dared to cycle down a very steep slope. A few meters in I’d lost control, somersaulted and broken my arm. Yet scarcely had I got rid of the plaster, barely had the break healed, before I was looking for the next dangerous adventure. I was still staring at the tree-trunk in front of me, and without thinking about it too hard I started to put one foot in front of the other. “You’re crazy,” Marty shouted, but I didn’t listen. Once I almost slipped, and glancing down at the rock-filled river below made me dizzy, but I was already halfway across. My heart beat faster; I ran the last two meters, landed safely on the other side, and flung my arms up in relief. My family walked along the left bank of the river as far as the bridge, while I walked alone on the right; from time to time I looked across at them and grinned. I’d never been so proud in my life. The river led out of the wood. It grew wider, the current faster; the water had risen after the last few days of rain. The bank was muddy and soft; a sign warned hikers not to step too close to the edge. “If you fell in there, you’d drown.” Marty stared at the thundering water. “Hopefully you’ll splosh in, then we’ll be rid of you at last,” said Liz. He aimed a kick at her, but she dodged him neatly and linked arms with our mother as naturally and nonchalantly as only Liz could do. “I’m afraid you leave me no choice. Granny’ll take good care of you.” She imitated our grandmother’s reproving look, and Liz laughed. Our mother was the undisputed star of the family, for us children, anyway. She was attractive and graceful, had friends all over Munich, and gave dinner parties attended by artists, musicians or actors she’d met God alone knows where. Incidentally, when I describe her as “attractive” or “graceful,” it’s a huge understatement. Such pathetic words can’t even begin to convey our sense that we happened to have a mixture of Grace Kelly and Ingrid Bergman for a mother. When I was a child it seemed incomprehensible to me that she wasn’t living the life of a famous actress; that she was just a teacher. She often went about her domestic tasks with an amused, affectionate smile, and it was only later that I realized how constrained she must have felt. We stopped for a rest in a meadow by the river. Our father filled his pipe while we ate the ham baguettes we’d brought along. Later, Mother played a couple of Gilbert Bécaud songs on the guitar. My brother pointed to the opposite bank, where another family had just sat down. The children were about our age, and they had a young mongrel with them, romping in their midst. It was midday: the sun was high in the sky. Marty and I took off our T-shirts and lay down on a blanket in the heat. Liz doodled in a sketchpad; little drawings, and her name, over and over again. Back then she would often try out different styles of handwriting to see which suited her signature best, and she’d write it everywhere—on papers, on the table, in folders, on napkins. Liz, Liz, Liz. Our parents went for a stroll and disappeared off into the distance, snuggled up against each other. We children stayed behind in the meadow. The landscape was saturated with sun. Marty and Liz played cards; I tinkered about on the guitar and watched the family on the other bank. I kept hearing their laughter, overlaid with the barking of the dog. From time to time one of the children would throw a stick, which the mongrel would fetch immediately, until the boy clearly started to get bored and hid the stick under a blanket. The dog, however, wanted to go on playing; it kept running up to each member of the family in turn before eventually trotting a little further downstream. A fairly large branch was caught in the undergrowth on the riverbank. The dog clamped its jaws around it and tried to tug it out, but couldn’t. The current was powerful and fast just there. I was the only one watching, and I felt the hairs stand up on the back of my neck. The young dog tugged at the branch, and in its eagerness it came closer and closer to the water. I was about to attract the attention of the family on the other riverbank when I heard a yelp. A section of the bank had broken away, and the dog had fallen in the water. It was only clinging on by its front paws and teeth, which were still sunk into the branch. It whimpered, and tried to struggle back up the crumbling riverbank, but the current was too strong. Its whimpering grew louder. “Oh my God,” said Liz. “It’s not going to make it,” said Marty. He sounded so categorical, as if passing judgment on the scene. The family on the other side ran to the dog. They had just reached it when the branch broke free of the undergrowth and was swept away, taking the mongrel with it. It kept its head above water for a little while, then vanished into the river. As the children opposite screamed and cried, I turned away and looked at my brother and sister. I’ve never forgotten the expressions on their faces. That night, in bed, I could still hear the dog whimpering. Liz had been depressed all day; Marty had hardly said a word. The oddest thing, though, was that our parents weren’t there when it happened. Of course they’d tried to comfort us when they got back, but it didn’t alter the fact that my siblings and I had experienced something that was shattering only for us. I tossed and turned half the night. I couldn’t stop thinking about how the carefree happiness of the family on the other bank had been destroyed in the space of a few seconds. 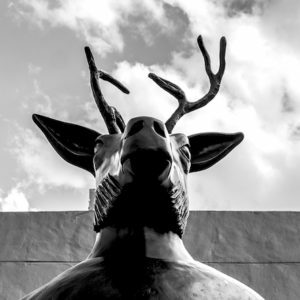 I remembered my Uncle Eric; how we’d been told that he had “lost his life.” Up until then my life had been a sheltered one, but clearly there were invisible forces and currents that could change everything at a stroke. It seemed that there were families that were spared by Fate and others that attracted misfortune; and that night I wondered whether my family were one of these. From The End of Loneliness. Used with permission of Penguin Books. Copyright © 2019 by Charlotte Collins.